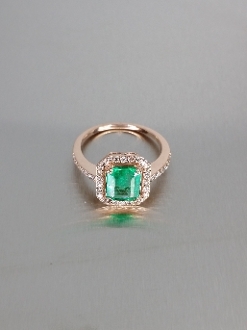 This gorgeous ring has a stunning emerald set in solid 14 karat rose gold with white diamonds on the halo around the stone. This is a breathtaking piece. The weight of the emerald is 1.04ct. Total diamond weight is 0.28ct. Emerald is the official birthstone for the month of May.